In 2013, the BIGG initiated a project to monitor soil moisture in local grazing systems (funded by a Caring for Our Country Community Landcare Grant). 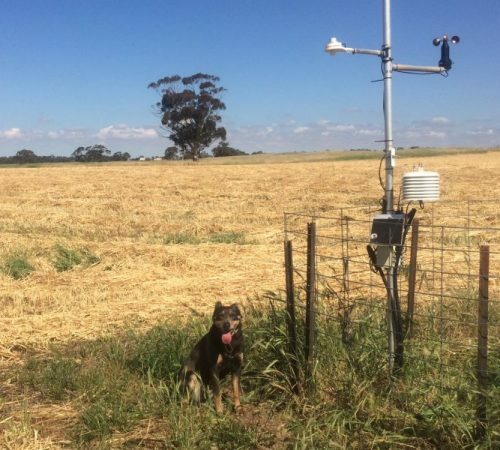 This involved the establishment of telemetry based monitoring stations located in three representative pasture paddocks (Flaxman Valley, Keyneton and Koonunga), which was the first time a farming systems group in Australia has demonstrated soil moisture monitoring in pastures. To help understand the information and associated graphs derived from the downloaded data refer to the Fact sheet: Interpreting information from BIGG’s telemetry based monitoring stations. The Adelaide and Mt Lofty Ranges NRM Board funded the on-going operation and web-hosting of the weather stations and in March 2017 they also funded a new project (through their Sustainable Agriculture Industry Support scheme from the NRM levy) to develop the information recorded from BIGG’s soil moisture and weather stations for decision-making. Further support was provided for the project by the South Australian Murray-Darling Basin NRM Board in October 2017. For further information about the current soil moisture status of local representative soil types, a network of soil moisture probes are located throughout the SA Murray-Darling Basin region and can be accessed here. Monthly analysis on the status of the three local pasture paddocks (located at Flaxman Valley, Keyneton and Koonunga) being monitored for their soil moisture use. Disclaimer: The data generated from the BIGG soil moisture monitoring sites is provided for information only. Any actions or decisions made by users is at their sole discretion.